Mike Gatting and Shakoor Rana got involved in one of the ugliest altercations in the history of the game that threatened the diplomatic ties between England and Pakistan. Mike Gatting and Shakoor Rana got involved in one of the ugliest altercations in the history of the game that threatened the diplomatic ties between England and Pakistan. Arunabha Sengupta relives the unfortunate incident that took place in Faisalabad on December 7, 1987. Pakistani umpire Shakoor Rana’s affair with controversy was long, lasting and often passionate. And Mike Gatting did indulge in some more than casual flings with murky episodes himself. So, when these two factious figures clashed, the sparks that flew were red hot and rambunctious. In 1978, when India resumed cricketing ties with Pakistan after a 17 year hiatus, Rana, the officiating umpire, warned Mohinder Amarnath for running on to the danger area during his follow through. An incensed Sunil Gavaskar, the vice-captain of the side, walked up to Rana and openly charged him with allowing Imran Khan and Sarfraz Nawaz to overstep while bowling at the Indian batsmen. 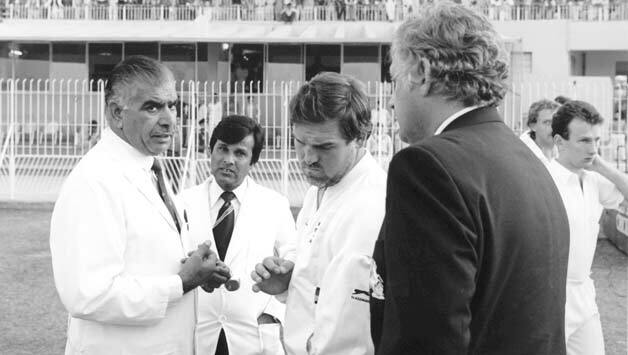 The issue was resolved diplomatically – not exactly to Gavaskar’s liking – given the high profile political implications of the tour. It was the first of Rana’s many major brushes with the touring cricketers. In December 1984, during a Test match at Karachi, the normally cheerful New Zealand captain Jeremy Coney threatened to take his side off the field after an appeal against Javed Miandad had been turned down by the same umpire. Unfortunately, the same two umpires were standing in the second Test between Pakistan and England in Faisalabad from December 7, 1987. Earlier in the series, Rana had already earned the wrath of the English captain Mike Gatting at Lahore by putting on a Pakistan sweater. With three balls to go on the second day, Pakistan was struggling at 106 for five in response to 292 compiled by England. With Eddie Hemmings bowling, Gatting brought David Capel in from deep square-leg to prevent a single. According to the captain, he had informed the batsman, Saleem Malik, but Rana, standing at square-leg, stopped play and accused him of cheating. A furious Gatting confronted the equally riled umpire, both wagging their fingers ominously and exchanging a spate of swear words, a lot of it transmitted worldwide through the stump microphone. A seething Rana refused to continue unless an apology was rendered and Gatting steadfastly refused to oblige him. “In Pakistan many men have been killed for the sort of insults he threw at me. He’s lucky I didn’t beat him,” Rana said after the row. The England captain, however, claimed that the square-leg umpire had no business getting involved in the game and he himself had no reason to apologise. A day’s play was lost. Foreign Office got involved and the British Ambassador was rushed in to soothe the Anglo-Pakistan relations. Gatting, threatened with the loss of English captaincy, was forced into writing an apology. “Mike Gatting was packed off to the headmaster’s study without so much as a Wisden to stick down the back of his trousers,” wrote Martin Johnson in The Independent. The Pakistan board stood solidly behind Rana, appointing him as umpire for the deciding Test. The decision was revised only when it became clear that England would not play if Rana officiated. Test and County Cricket Board (TCCB) subsequently paid all players in the England squad £1000 as ‘hardship’ bonus for the tour. Rana stood in just three more Tests. However, he remained at peace and happy about his 15 minutes of fame, often charging considerable sums for interviews about the incident. He also told and retold the story of the pair meeting again in England years later. Gatting had supposedly exclaimed, ‘Oh God, not you again,’ and driven away like a haunted man. Gatting was removed as captain six months later due to an incident involving a bar maid, Louise Shipman,in his hotel room during a Test match at Trent Bridge. (Amul captured this in an advertisement: If life’s Gatting bad, have a ball with Amul Butter. You can even take it to your room.) However, many still link his ‘sack’ as an opportunity pounced upon by an English selectors on the lookout for a suitable opportunity ever since the Rana incident. Gatting later admitted, “It wasn’t a very proud moment of my career. It is one of those things that has gone down in history. It will probably always be remembered.” However, there is a section of cricketing fraternity who feel that he should have apologised for writing that apology to the pompous Rana. The incident probably acted as a catalyst hastening in the age of neutral umpires. England 292 (Chris Broad 116, Mike Gatting 79; Abdul Qadir 4 for 105, Iqbal Qasim 5 for 83) and 137 for 6 decl. (Graham Gooch 65; Abdul Qadir 3 for 45) drew with Pakistan 191 (Saleem Malik 60; Neil Foster 4 for 42, John Emburey 3 for 49) and 51 for 1. Man of the Match: Chris Broad.